Some of the symptoms of perimenopause and menopause may include hot flashes, irregular or skipped periods, mood swings, insomnia, fatigue, depression, irritability, headaches, changes in libido, anxiety, weight gain, mental confusion and difficulty concentrating, night sweats, reduced bladder control, and hair loss or thinning. 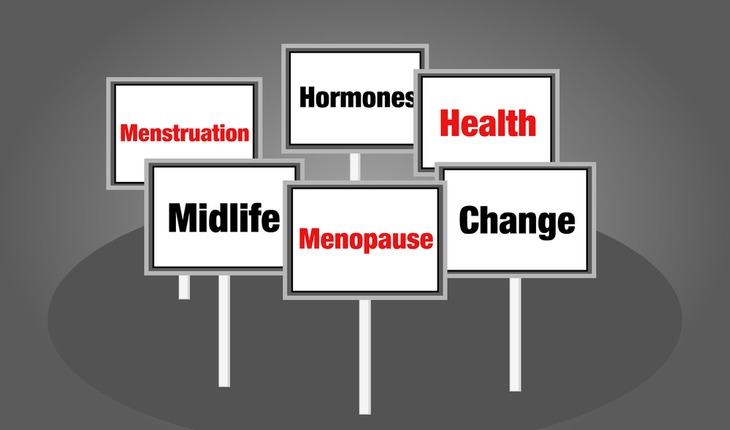 Many women going through menopause are on the hunt for the best solutions to these side effects. Some of the most common questions that usually come up during this period are about how to deal with hot flashes, mood swings, hormones and aging, and about skin care for menopause. Menopause symptoms will be different for every woman. Interestingly, symptoms can also sometimes vary by culture. Japanese women, for example, report fewer hot flashes, among other symptoms; Thai women tend to have more headaches; Scottish women report fewer severe symptoms; Greek women have a higher rate of hot flashes; and Mayan women report few or no symptoms at all. This could be related to a variety of different factors, including diet, lifestyle, and environment. If you’re nearing menopause, you may experience some, or perhaps none, of the symptoms. But if you do, here’s how you can manage them. • Avoid triggers such as caffeine, sugar, spicy food, acidic foods, alcohol, tobacco, hot tubs and saunas, aerobic exercise, stress, and anger. • Keep a glass of water by your bedside. Throw in a couple of ice cubes to keep it cold through the night. • For immediate cooling relief, keep a bucket of ice near your bed with a face towel on top. • Make sure you’re getting enough calcium, magnesium, and vitamin D.
• Practice rhythmic breathing and use it when hot flashes strike. • Regular sessions of exercise or yoga can get rid of stress and help you get a better night’s sleep. • Massages, meditation, and deep breathing are also effective for ongoing stress. • Talk about your concerns with friends, especially women who are going through menopause too. It’s a great way to release tension and learn about how they’re managing their menopause symptoms. • Herbal supplements, such as valerian and chamomile, have been shown to help with menopause-related insomnia. • Keep your bedroom cool and sleep with a light sheet. Keep extra blankets nearby in case you start to feel chilly. • Changing hormone levels during menopause can completely alter the physiology of skin—it can become oilier than usual, or drier than usual. So, the skin care products you were using before may not be as effective anymore—it’s important to use the right products for your new skin type. • For oily skin, use a gentle cleanser. Avoid the urge to use a harsh exfoliant. • For dry skin, avoid long showers or baths in scorching hot water, which will make it worse. Use a hydrating moisturizer while skin is damp and more absorbent. Marni Andrews holds a Master’s degree in Journalism from the University of Western Ontario. Throughout her editorial career, she has done extensive research in the area of healthy living and longevity and has written a wealth of material on anti-aging, health, and wellness. She has also developed several different magazine concepts and edited a wide range of publications. Marni has always had a passion for staying ahead of the curve when it comes to anti-aging. She’s spent many years blogging about the latest skin care and lifestyle trends for women.